DETROIT — The developer of the newest and largest retail shopping center in the city in two decades, REDICO,will officially open the Gateway Marketplace on Thursday when anchor Meijer Supercenter opens its doors to the public. 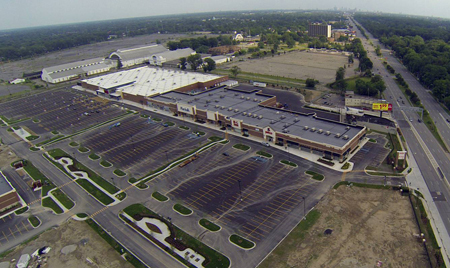 The major shopping development at Eight Mile and Woodward is a ground-up development located on a 36-acre site featuring national chain stores in food, clothing and unique local service and apparel retailers. The $72 million project groundbreaking was held in May of 2012 with an opening scheduled for the fall of 2013. The Mejier gas station was the first business to open on the site in mid-July and the remaining retailers will be opening in phases as each store adheres to its own launch schedule, said Dale Watchowski, president and CEO of REDICO, the Gateway Marketplace project developer. Watchowski added that the Southfield-based REDICO has worked collaboratively with all stakeholders in managing the $72 million development to completion and securing leases with retailers to bring a wide range of shopping options to the city of Detroit and the adjoining neighborhoods of Ferndale and Hazel Park. He said the shopping center is more than 95 percent leased and should be fully occupied by this fall. Meijer has completed its hiring process and brought more than 500 of the estimated 900 new jobs to the Gateway project. Other retailers slated to open this summer include discount retailer Marshalls and apparel retailer K+G Menswear. A PNC Bank, PETCO and Five Below are also slated for opening this year. In all, the project has more than 350,000 square feet of retail. According to REDICO there are some 175,000 customers within a three-mile radius of the Gateway Marketplace or 68,000 households that have been clamoring for places to shop in the neighborhood. The high-traffic area of 8 Mile and Woodward has nearly 120,000 cars passing the intersection daily. “We were absolutely delighted to work with REDICO – an absolute first-class developer — on this exciting project in my hometown of Detroit to help bring new businesses to this area for the first time in decades,” said Jim Bieri, a principal with Stokas-Bieri real estate that collaborated with REDICO on leasing the commercial retail space.